I have misgivings about sharing this walk for it is a favourite of mine: in the 48 years that I have known it I have rarely met anyone other than those that work the land here. 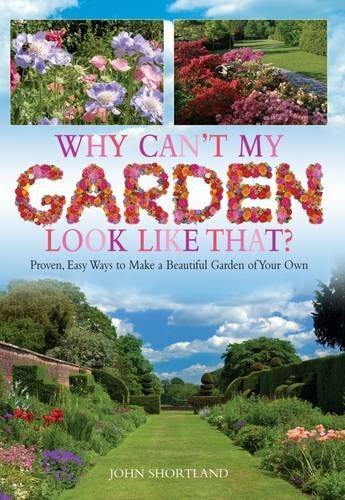 Do I want to encourage others to discover its beauty? I’m not sure. 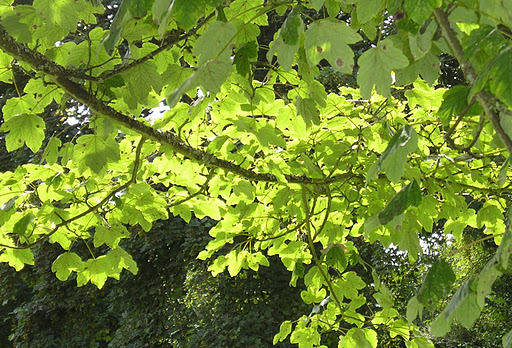 This circular walk begins with the open expanses of Brendon Common but follows more sheltered winding lanes before descending through beech woodland to Rockford and the East Lyn River. A steep climb past Brendon church returns you to the moor. How long does it take? There’s no easy answer to this – allow two hours although experience tells me there are so many distractions along the way, including the Rockford Inn, that it can take much, much longer. Whether you want a quick sprint or a leisurely amble good supportive footwear is essential as is the ability to climb hefty hills. There is plentiful parking at Scobhill Gate, the cattle grid on the B3223 that denotes the westernmost boundary of Brendon Common. From here walks radiate across the 2000 acres of heather moorland but our route takes us over the cattle grid into farmed country and turns right by the hairpin bends at Brendon Manor Stables. After a few hundred yards the road, which is flanked by hedges of hazel, ash, furze, bramble and bilberry (known locally as wurts), meets Gratton Lane. This is very much ‘home’ territory for me, for it is here at Brendon Barton that I arrived as a lad to work and play in 1968. Opposite the farm there are fine views of Brendon church and in the far distance Countisbury Common and the sea. Walking along Gratton Lane is lovely at any time of the year but is at its best in spring when the beech hedges are bursting into leaf and primroses and bluebells nestle at their feet. These banks are an ancient method of providing shelter, as well as a barrier to livestock, from the fierce gales and snowstorms that sweep in from the Atlantic. The banks stand about five feet in height, lined with stone with the beech planted above. Just as the lane starts to descend it enters woodland and it is here – just past the warning sign denoting the ford that crosses the road – that a footpath is taken to the left. The path follows a pretty stream as it tumbles over rocks down to join the East Lyn River. It is here that the unwary walker can also take a tumble as the path crosses outcrops of rock that become quite slippery when damp. This stream has everything a larger one would have – cascades, waterslides, ferns growing from niches – but all in miniature. Despite its diminutive size it once powered a sawmill. The mill has long been a ruin and is now fenced for safety but the rusting ironwork is still visible. Just beyond the old building the path joins the road. Turn left and follow the lane to the hamlet of Rockford. You are now walking in the Brendon valley with its beechwoods clinging to the steep hills high above, home to a number of rare rowan trees (Sorbus) unique to the area. The East Lyn River is a major river; when water levels are low it is difficult to imagine its ferocity when in spate. In 1952 it destroyed bridges, houses and lives as it passed through the valley culminating in the flood disaster at Lynmouth where thirty-four people lost their lives and over one hundred houses were destroyed. The Rockford Inn is a good place to stop for a beer; they also serve cream teas. Just make sure that you put the cream on the scone before the jam in the Exmoor tradition! It is possible to extend the walk to Watersmeet (where there is a National Trust tearoom) by crossing the river. Once past Rockford the road starts to climb until it reaches Brendon church. The hill is a killer – it’s not called Church Steep for nothing! The church which nestles into the hill and looks out across the combes looks as if it has been there for centuries. In reality, it was moved stone by stone from nearby Cheriton in 1738. 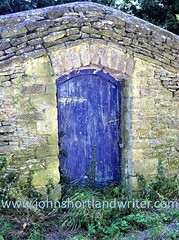 It is simply decorated inside but has some attractive stained glass. Brendon Barton, passed earlier, can be seen from the steps of the church. Follow the lane back to the farm; from there retrace the original route back to Scobhill Gate. 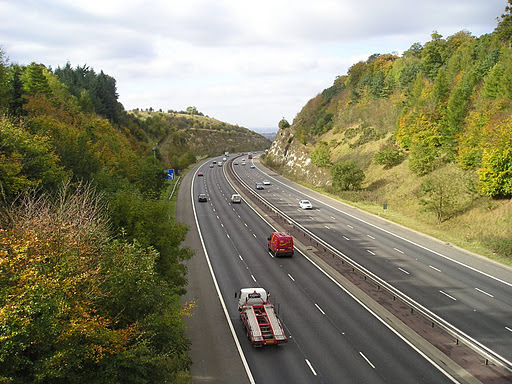 Exmoor is a National Park in the southwest of England and straddles the counties of Devon and Somerset. Apart from miles of wonderful moorland walks, it also has the highest sea cliffs in England, pretty villages and spectacular wildlife including the majestic Red Deer. Native Exmoor ponies roam the open moor. Now a rare breed they remain virtually unchanged from pre-history. 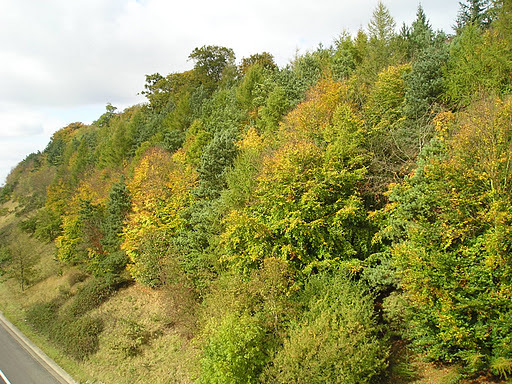 When I wrote my initial post on the ancient hedgerow that leads uphill out of the secret valley I intended to update it on a monthly basis (click here). What a failed idea that has proved to be! For March 10th was as hot a day as any summer’s and that, coupled with a very dry winter, created the worst drought for many years. The day that I had intended to walk the hedge (and also the day that a hose pipe ban was announced) the heavens opened and we have had torrential rain ever since. 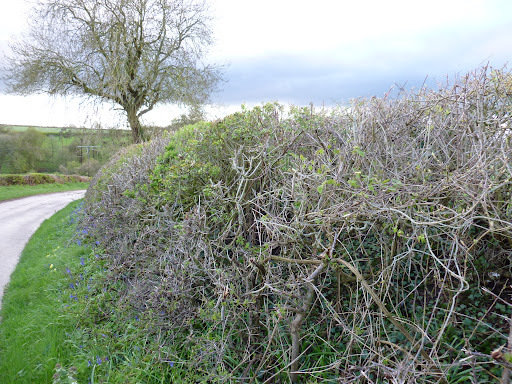 I have been soaked to the skin most days because of work – I had no intention of a second soaking whilst carrying out hedge surveying upon my return home. A break in the clouds, however, allowed me to sprint up the lane snapping away with the camera moments before the next deluge. No time to marvel at the way nature responds to climate or to look carefully to see what species of plants might be new to my eyes. 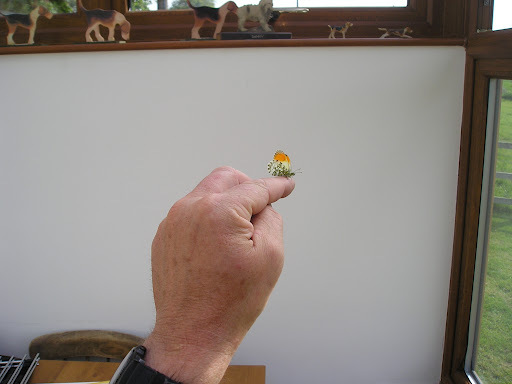 The only wildlife I saw was a solitary snail, pale lemon in colour and rather pretty – if you can describe a snail as such – which dropped off it’s grass blade perch the moment I got the camera in focus. I’m sure I heard it giggling in the undergrowth. Here is what I did see. Cowslips (Primula veris) are a great favourite of mine bringing back memories of early school for ours had a play area that was carpeted with them. Years ago no-one worried about picking great bunches of them or digging some up for the garden which we all did yet the numbers there didn’t seem to diminish. 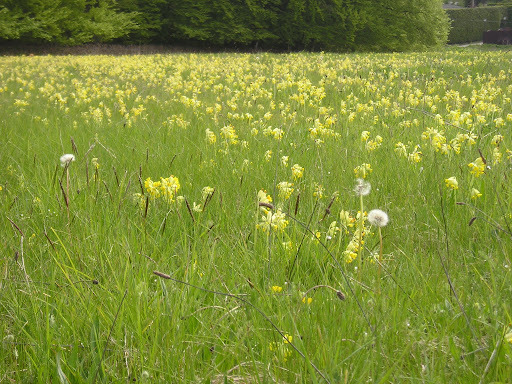 However, overpicking (or perhaps spraying roadside verges) meant that the cowslip became a scarce plant. 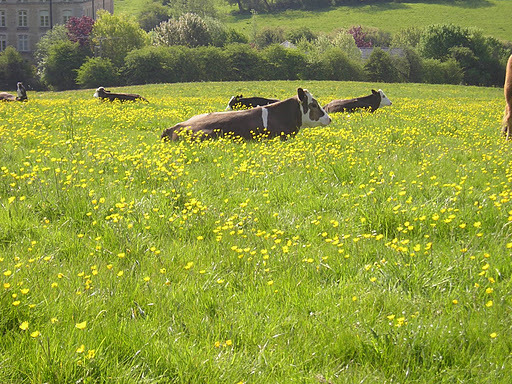 Happily, they are now seen sporadically along the Cotswold lanes although not on my old school playground which became a high density housing estate in the ’80’s. 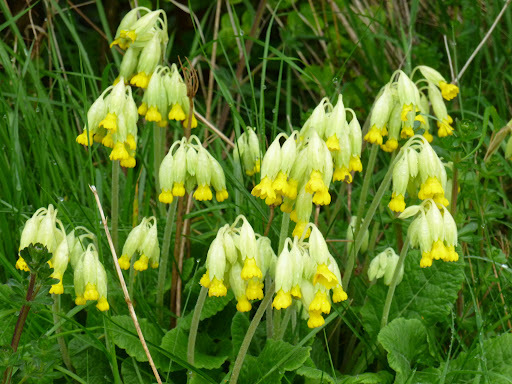 Along our hedge, cowslips appear in small numbers which, hopefully, will increase over the years. Further up the valley a field grazed only by sheep and never sprayed is a yellow carpet at this time of year and on warm, still days, the faint smell of honey wafts around transporting me back more years than I care to admit to. The last few primroses are still in bloom, quite late for this time of year and no doubt, like some of the daffodils, lasting longer because of the cool, damp weather. 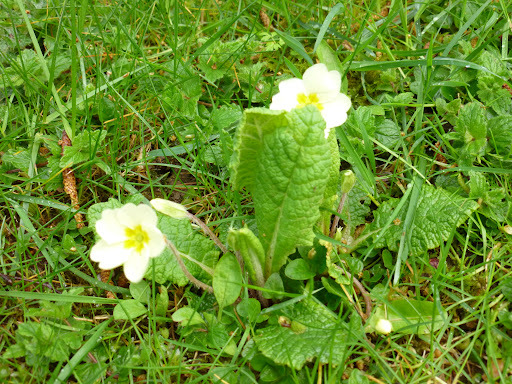 Primula vulgaris, their botanical name, sounds like a misnomer for their is nothing vulgar about them, for every part of a primrose is pretty, whether it is the palest lemon of their petals, the deeper yellow throat or the fresh green of their leaves. Even the ribbing and lines of their veins create attractive patternss and textures. Vulgaris does, of course, mean common – there is nothing common about them in appearance either! The hot March had an odd effect on plants. 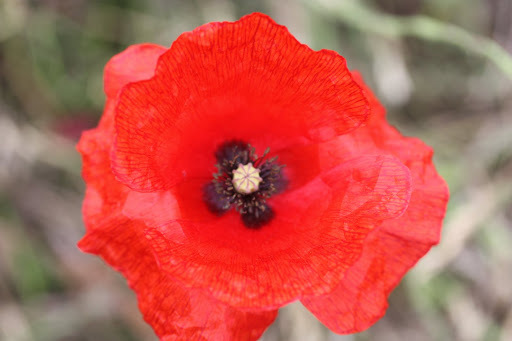 Some revelled in it, throwing caution to the wind and paraded their summer finery early, whereas others seemed to remember the old saying about not casting a clout ’til May is out. 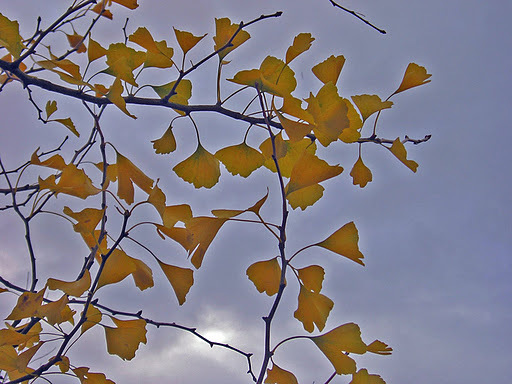 Proven right, when cold returned in April, they now seem reluctant to even expose a leaf and, as a result, the hedgerow is bright green in places, yet bare and wintry looking in others. 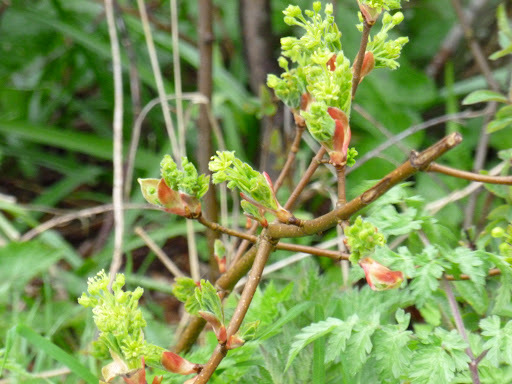 Field Maple is a classic old hedgerow plant. Left to grow untouched it makes a medium sized tree of, to my mind, simple but great beauty. However, it is usually trimmed to make a reasonably dense, twiggy barrier. 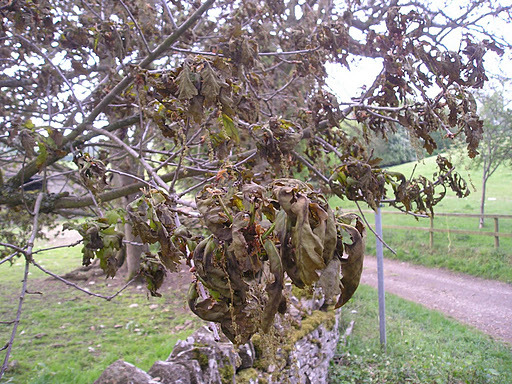 Like all maples the flowers and leaves emerge together but I had never noticed before the rich mahogany colour of the leaf buds. Acer campestre. 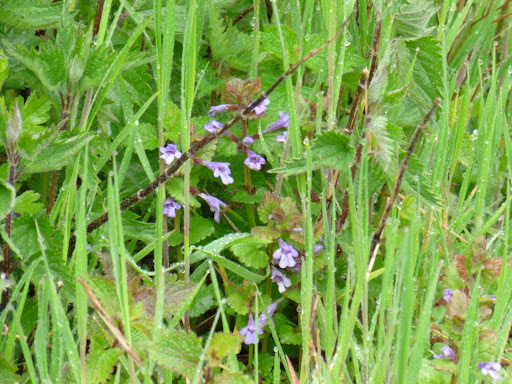 A plant so common and so small as to be overlooked, Ground Ivy (not related to ivy but to mint)has to be viewed on hands and knees to see its quiet beauty: tiny, mauve, hooded trumpets darkening at the throat. According to my old herbals it was used for all sorts of ailments from the uterus to inflamed eyes and everything in between. Glechoma hederacea, in a greyish variegated form is often used in hanging baskets where it is seen trailing in ugly, thick ribbons. Leave it where it belongs – trailing over the ground at the foot of a hedgerow. Perhaps it should be used in the garden in this way? 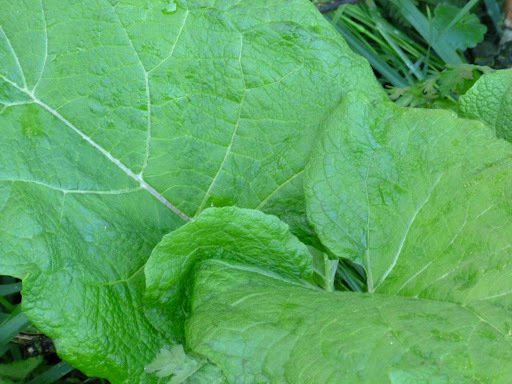 Jack-by-the-Hedge or Garlic Mustard is a common plant and quite a useful addition to early spring salads for its shredded leaves have a mild garlic taste. 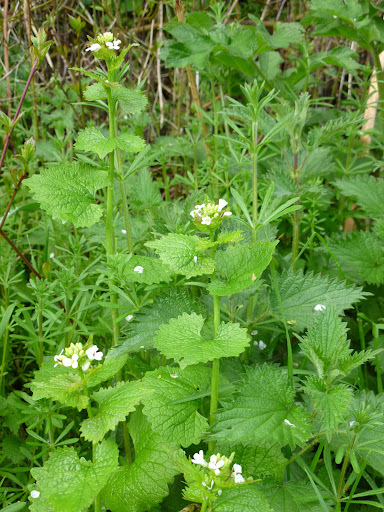 In the photo above it grows along with stinging nettles and the fine leaves of Cleavers or Goose-grass. It is the food plant of the Orange Tip Butterfly which is quite regularly seen throughout the secret valley, although scarce so far this spring due to weather conditions. Occasionally they fly into the house and require rescuing – not always as easy as in this photo! Bluebells, Hyacinthoides non-scriptus, are another of the ancient woodland indicators (click here for more details of this term) and they flower the whole length of the hedgerow. 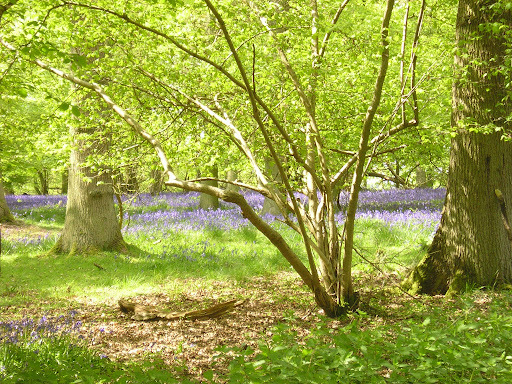 In the Chiltern Hills, the area where I spent most of my life, the beechwoods are renowned for their Bluebell carpets (photo below). Here, they grow more sparsely, with the occasional white flowered sport growing amongst them. 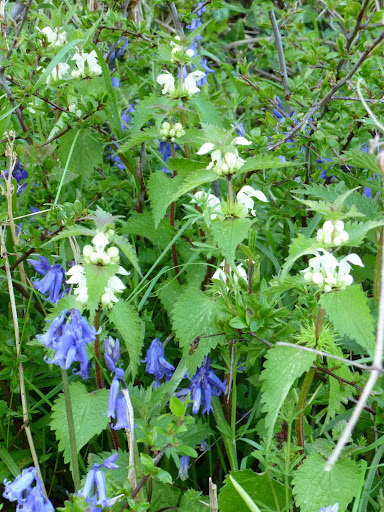 In the photo above, it is the white flowered dead-nettle they mingle with. The dead-nettle, Lamium album, is not related to the true nettle and has no sting, just an unpleasant smell when the leaves are crushed. In the garden it is a nuisance with a white, running root, quite thick and brittle unlike the stinging nettle’s yellow, fibrous root system – a useful way to tell them apart if uncertain, apart from the sting, of course. The large leaves of Burdock, Arctium minus, are already forming rosettes. It will be a while before they send up their spikes of lilac flowers, reminiscent of those of the thistle and even longer before the troublesome round seedheads, the burs, stick to clothing and She-dog. It was at this point that the heavens opened once again giving me just time to take a snap of the little winding river. It’s clear, sparkling waters have been transformed by rain to a swirling, brown muddy spate that has now burst its banks spreading out across the valley. The lower reaches of the river Otter turn from fresh water to brackish as the river joins the sea. At low tide, mud and salt flats are exposed creating a safe habitat for the hundreds of seabirds and waders that feed, breed or rest on migration there. 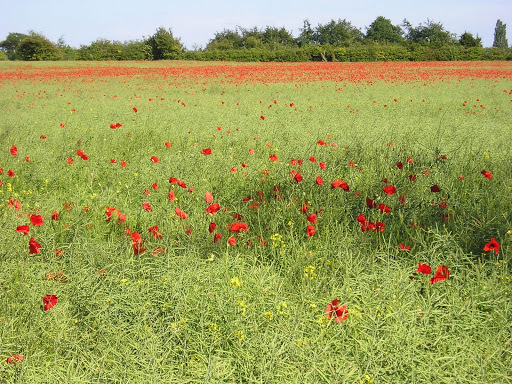 This area, including its wildlife, I have written about earlier – it can be found by clicking here. 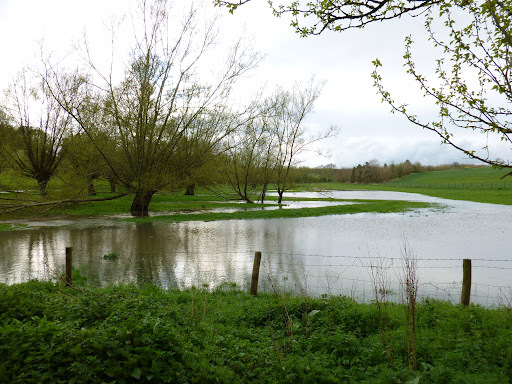 This post describes a walk a little further upstream where the river flows through fertile fields of wheat and where cattle and sheep graze in lush riverside meadows. The river – which like our river in the secret valley – is really little more than a stream (or ‘brook’ as we say where I originate from – English dialect is another fascinating subject that I might write about one day!). One moment fast flowing, the next slow, but always crystal clear, the view is one of steep banks and stony bottom. It is here, in the shallower water, that the trout – huge in comparison with our tiny ones at home – sway in the current, waiting for food to be swept down towards them and their ever open mouths. At one place where the river runs across a steeply shelved weir, a salmon run has been built: a series of steps for the salmon to leap to reach the upper levels of the river for spawning after their long migration. Whether they still do, I do not know, for salmon stocks in England are dwindling fast. Wood and water, just nothing but water and wood, for the crowds of visitors that explore the river close to the beach and form long queues at the ice cream stalls have all been left far behind. Now the sights, sounds and smells are only those of nature on this glorious late summer’s day. The trees are only just beginning to show a hint of the autumn to come but, somehow, their berries have already stamped their mark on the autumn landscape, glowing in and reflecting the sun’s warmth. Along the river bank, swamping much of the native flora, the Himalayan Balsam is giving a final explosion of colour before the first frosts destroy them for another year. And explosion is the correct description of their bursting seed heads which throw the seed far and wide as they split open. Found in many damp places throughout the country, for its seeds are also dispersed by the movement of the water, the Himalyan Balsam is an unwelcome immigrant to Britain which is virtually impossible to control. A member of the Impatien family, its seedheads are similar to those of our familiar garden Busy Lizzie. Along the final stretch of our walk, the river is backed by the same red sandstone cliffs that can be seen by the coast. How many millenia did it take for this gentle stream to cut its way through to its present level? My photography skills – or perhaps my patience – did not allow me to get shots of the kingfishers that darted up and down as a flash of azure along this reach of the river. High up in the rock face, their nesting holes (or were they the breeding sites of the sand martins that had already begun their long flight south to winter in Africa?) were more easily photographed. The ten mile walk to the source of the Otter will have to wait for another visit to the West Country. Oh, and I nearly forgot to mention, otters can be found – but rarely seen – along the whole length of the river. As far as butterflies go, the Large Skipper is not particularly uncommon but I don’t recall seeing them in quite the numbers that I have this summer. They are active butterflies, frequently on the move and fast flying but eventually come to rest to feed or bask in the warmth of the sun. The Large Skipper lays its eggs on a variety of grasses and so can be found in many habitats, particularly the edge of woodlands and along woodland rides. The photo below, taken in the deeply wooded Chiltern Hills, may look like a woodland ride but it is an ancient Saxon field or ‘assart’. Assarting – the destruction of forest for agriculture – was considered to be one of the gravest crimes of all when carried out in any of the Royal Forests. This field still has remains of old coppiced or possibly of layed hedge – there is one Field Maple, Acer campestre that probably dates back a 1000 years to Saxon days. It now consists of a series of smallish trees around the space where the original trunk would have been. Despite its name, the Large Skipper is quite a small butterfly. The females, which are slightly larger than the males, have a wingspread of less than one and a half inches. Their diminutive size has not prevented them from spreading far and wide globally: they can be found from England in the west of Europe, right across the continents, to Japan in the Far East. For some reason they are not found in Ireland or most of the Mediterranean islands. However, their range is still spreading so perhaps they will colonise these places too one day. The golden glow of these butterflies gives them a certain charm but they can not be described as pretty, especially with their huge, bulbous eyes. This glow is also present in the underside of the wing which shows up faint spots and helps to distinguish them from the Small Skipper and the Silver Spotted Skipper, both of which are to be found in Britain but far less frequently. The latter, incidentally, is also found in parts of North America. Another golden butterfly, but this time a very attractive one, is the Comma. It is everything the Large Skipper isn’t – delicate, attractively marked and large. This butterfly was rare when I was a child but numbers have increased rapidly in recent years and it is now no longer considered endangered. The winter may have been one of the snowiest and coldest for a long time but it hasn’t made the slightest difference to the displays of snowdrops and aconites which are now at their best. There has been a great upsurge of interest in the different varieties of snowdrops in recent times. To those of you who just thought there were singles or doubles, it may come as a surprise to learn that there are more than 500 named cultivars derived from the 19 or so species found in the wild. All are variations on a theme, basically white petals with green (or occasionally yellow) markings. 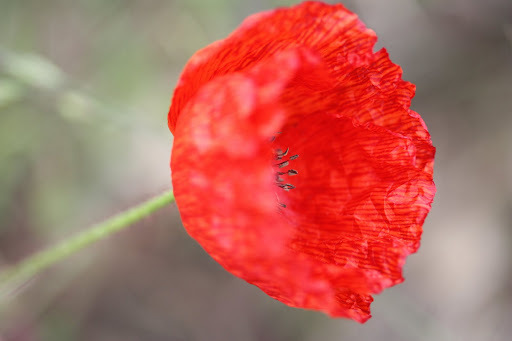 The Royal Horticultural Society Plant Finder lists 251 as being available in the UK and prices for the more unusual ones start from a few pounds per bulb to large sums of money for the very rare. Personally I am quite happy with the simple purity of the common single type and am also aware of the difference, namely the ‘frilly petticoat’, of the common double one. 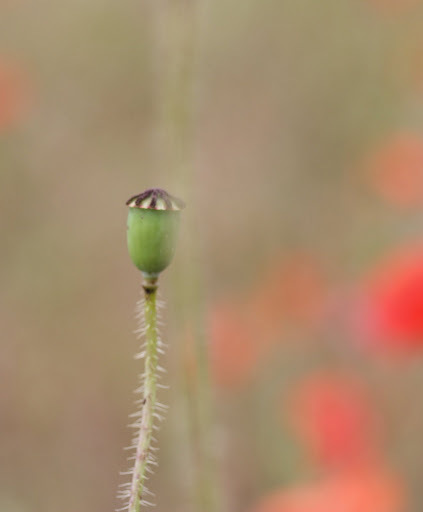 Now people get very excited by upturning the flowerhead so they can see a slightly larger speck of green on the bloom or scrabbling about on their knees in search of the single rarity that lurks amongst the ordinary – and good luck to them. Call me boring or unimaginative if you want but just give me bog standard Galanthus nivalis any day – preferably in their thousands. This really is a case where more is best as the carpets of snowdrops that flower in the garden of the house that was built for me two hundred years ago proves. (Readers of this blog may remember the post describing this house, along with the possibility that I have been reborn and finally reunited with it – most of the time I say this tongue-in-cheek, occasionally I half believe it). According to tradition the nuns that took over the property upon ‘my’ death planted them and now they have spread to cover many acres. Is there any better way for ‘me’ to be remembered? Well, yes, there could be. My death next time round should be marked with the Winter Aconite, Eranthis hyemalis. There is something very cheering and positive about their bright yellow, perhaps it is because we crave some strong colour after a long winter. It is the same shade as the yellow daffodils and also of forsythia. By the time these have finished, weeks later, we are fed up with it and find it all rather garish. But in January we start to notice the little ruffs of green leaves pushing through the ground and, quite suddenly, the flower is opening its blooms. I hadn’t noticed before just how similar the individual flowers are to a buttercup when fully open. Not surprising really, as they all belong to the same family, Ranunculaceae. The aconite, I assume, is so-named beacause of the similarity of the leaf with the tall herbaceous aconites, Aconitum. Neither snowdrops or aconites are native to the British Isles although both naturalise well and, given time, will occupy large areas. Conditions in this country must favour the snowdrop for snowdrop woods, whilst not common, are found with relative ease and are nearly always associated with a large country house. A much greater rarity is the aconite wood and I know of only one and heard of only one other. To visit it is an extraordinary experience for it is difficult to walk through the tens of thousands of plants that carpet the ground. This wood is also attached to a country estate but rarely visited and away from public paths. Perhaps that is why it has survived. Sold as ‘in the green’, both snowdrops and aconites establish in the garden best when transplanted now, that is with their leaves and flowers still lush. A grower recently told me that snowdrops naturalise more quickly when aconites are grown amongst them, perhaps because the yellow flowers attract more pollinators. However, snowdrops in grass benefit from an annual feed whilst aconites detest it. A case of ‘you pays your money and you takes your choice’, perhaps?